STW Challenge for February: Splish-Splash. Drip-Drop. I have many ideas for upcoming Still Life With challenges. But I couldn’t resist making February’s challenge all about messy, moving food when I saw this little clip on DIY photography pop up in my newsreader a week ago. The post featured the photos of Christian Schierig in a series of fruit splashing into water. Freezing time in shots like these requires a lot of skill and some fancy flash gear. But, simply capturing movement in your food doesn’t have to. Honey or syrup dripping lazily from the edge of a pancake makes a gorgeous shot. 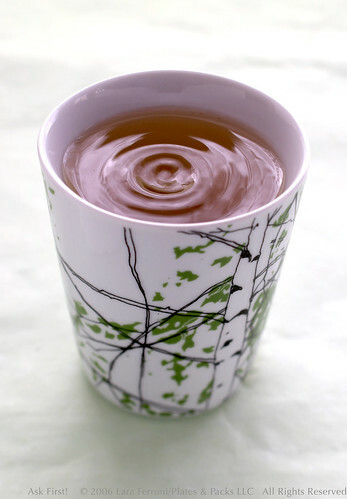 A single drip creating waves in a tea cup is equally beautiful. The trick to all these shots is to think a lot about focus, and making sure that the point of interest in the photo is clear and sharp. If you are shooting with a point and shoot, make sure you are using the macro mode on your camera! And, if you are using an SLR, you might want to turn off your autofocus and set the focus yourself manually. Once again, a tripod will go a long way towards improving your shots. As for last month, the White theme was a huge success! I saw some fantastic images, and really appreciate folks being open to (and hungry for) feedback. As a reminder, the feedback shouldn’t just be coming from me… if you are posting photos to the group, do make sure you spend some time viewing the photos of others, and adding your comments. We all have insights to offer. The usual rules and are up on the Flickr group… the things like be constructive, take the photos during the month if possible, 3 photos per person and the last day is February 28th. This entry was posted in Photography Challenges and Critiques. Bookmark the permalink. after seeing this image http://www.dpchallenge.com/image.php?IMAGE_ID=440344 .. i think we should all just pack it in.. how could i do any better? Nika – That is a gorgeous image… thanks for sharing! Its a great theme and I am sure there are other great shots that the SLW Flickr members will submit! Thank you so much for sharing all the information. I would like to improve my food photo results. At the moment I am using Canon 350 D with lenses : EF-S 18-55 (kit) and 70-300 mm F4-5.6. I want to invest more on my lense collection, could please recommend the lense I should buy ? Thank you so much. SyL – For food photography, there are two lenses that I really find indispensible: the 50mm and the 100mm macro. My 50mm is the 1.4, which is fantastic but a little pricey. It’s very fast, which means in addition to the studio, it’s also the lens I like to take with me for shooting in restaurants, etc. However, if it’s too much for your budget, the 50mm 1.8 is a great option too. The 100mm macro is a 2.8, so it’s also pretty fast. Plus, it lets you focus super close to the subject. This is also a medium-priced lens, but I don’t know of any cheaper options for it. For more on what I’m using, see the posts in this category. Last Call for Still Life With White Theme!